We have had several discussions on LINCS about the Adult Literacy XPRIZE competition: XPRIZE Grand Challenge for Adult Literacy, $7 Million Adult Literacy XPRIZE , and Adult Literacy XPRIZE Apps Discussion, among others. The XPRIZE Foundation will be launching a new Communities Competition of the Adult Literacy XPRIZE designed to challenge organizations, communities, and individuals to recruit adults with low literacy skills to download and use apps that will engage and transform the lives of one million adult learners in the United States. The LINCS CoP Integrating Technology group would like to offer a place where those who may be interested can discuss this. For example, where I live there are several organizations that are actively thinking about or planning to submit a short proposal by this December. Perhaps this is true where you live, too. Some of these groups may view themselves as competitors, and not wish to participate in a public discussion about what they plan. Others may be looking to join with other groups in their town, city, state, region or national affiliation group, but don't know who else they might join with. Perhaps this would be one place to post an inquiry. If you are new to this communities competition, in addition to reading about it on the Adult Literacy XPRIZE website https://communities.xprize.org/ you may want to post your ideas or questions here. One question that often comes up is how the Adult Literacy XPRIZE is defining "community". Another is whether or not very large communities, such as a large state, be competing directly with small communities, such as an adult school, a small town, or a small community college English language program? I will invite an Adult Literacy XPRIZE representative to join our discussion to answer some of your questions. Other questions, involving strategies for reaching adults who may want to learn about, download, and use these apps, or for helping them to use the apps well, or about others' experience using particular apps may be answered by colleagues in this discussion. Some of the app developers may also wish to join this discussion, and can answer some questions about their apps. The XPRIZE team has added a section to their web site under "Resources" for those who have registered for the Communities Competition to see pilot opportunities from the XPRIZE teams. The idea here is that many organizations may not have experience with deploying Smartphone-based learning with adult learners. Deploying a no-cost pilot now enables the organization to get familiar with the process of on-boarding and tracking learners before the Communities Competition begins. If done early enough, can even help a team develop the strategy or content for their application. In case you missed it, below is a LINCS Community announcement about the Adult Literacy XPRIZE Communities competition. We expect to have Adult Literacy XPRIZE staff with us in this discussion to answer your questions about the competition, so please join in the discussion. Announcement: Join the Adult Literacy XPRIZE Communities Competition! Registration is now open for the second phase of the Adult Literacy XPRIZE, a $1 million, 15-month national competition! The second phase—the Communities Competition of the Adult Literacy XPRIZE—is designed to challenge organizations, communities, and individuals to recruit adults with low literacy skills to download and use apps that will engage and transform the lives of one million adult learners in the United States. The first phase of the Barbara Bush Foundation Adult Literacy XPRIZE, presented by Dollar General Literacy Foundation, challenged teams to develop mobile applications for smart devices that would produce significant increases in literacy skills among participating adult learners. In June, XPRIZE selected winning apps from five finalist teams (and the LINCS Community heard from them!). The second phase needs your innovative ideas for reaching low-literate adults that are seeking to improve their English reading skills. The deadline to register your team is December 8, 2018. Be among the first to enter the Communities Competition. (Check out this discussion thread in the Integrating Technology Group for ideas, support, and encouragement!) Participating in the XPRIZE is free, and you’ll receive proven literacy apps to distribute to adult learners. Your team will have the chance to compete for a share of $1,000,000 and transform one million lives through literacy. Interested in becoming an Adult Literacy XPRIZE Team Mentor, or helping teams in other ways? David et al - it appears as if the smartphone is replacing computers - which provides an adult learner with almost all that is necessary to study anything. And I know that the X Prize will stimulate the development of a lot of great Apps. In the field of ESL, many adults cannot easily attend classes but they do learn English using their phones independently. In my program I use my two websites plus videos I produced on YouTube. A key ingredient is WhatsApp which can be used to form groups. One of my groups is a homework group which my students enjoy and use to review lessons. I would like to request that you make a list of the information about all the X Prize apps for us to review and possibly use with our students. Paul, you asked for a list of the Adult Literacy XPRIZE apps that competing teams completed. You will find a list of the five Adult Literacy XPRIZE finalist apps at the end of the World Education Ed Tech Center blog article: https://edtech.worlded.org/app-to-speed-learning-circles-in-adult-esol-programs/ and a list of the finalists and semi-finalists at the end the article on my own blog. https://davidjrosen.wordpress.com/2018/09/20/app-to-speed-learning-circles-in-public-libraries/. I would guess that someplace on the XPRIZE website you could find the names of all the apps that were completed as part of the Adult Literacy XPRIZE competition, but you might want to start with the finalists and semi-finalists. Perhaps Monica Groves, from the Adult Literacy XPRIZE team, could point you to a page that lists them all. Note that the Adult Literacy XPRIZE winning app(s) has/have not yet been chosen, but will be very soon. I would like to welcome Monica Groves from the XPRIZE Foundation who will be joining us and will be able to answer some of your questions about the Adult Literacy XPRIZE Communities Competition. Feel free to ask at any time beginning now. I received an e-newsletter today about the Adult Literacy XPRIZE that has useful information and resources. If others would like to receive this newsletter, how can they sign up? You can access the October newsletter HERE and if you'd like to sign up for the newsletter and receive more information on how to register for the Adult Literacy XPRIZE Communities Competition subscribe HERE. 1. How will the competition categories will be determined? WIll the lowest number category for these competing teams trying to get app users, (as one colleague described it, the "Lightweight" teams) begin with the goal of having a minimum of 5,000 users for the app(s)? How many categories will there be altogether? (Will there be "Welterweights" and "Heavyweights" ?) and do you have a range of numbers for each of the categories? 2. How many apps might be available for the teams to have users download, and when will this be announced? 3. What exactly does a user need to do to be officially counted as using an app? 1. There will be three tiers. Click HERE for he breakdown. The winners in tiers 1 and 2 will be the entities that have attained the minimum threshold of participant downloads for the their tier and which have the largest number of participants use the app on at least three separate days. The winner in Tier 3 will be the entity with the largest number of participants who use the app on at least three separate days without need to meet a minimum threshold. 2. The number of apps available to download and distribute depends on how many winners will be decided by the independent panel of judges. All registered Communities Competition teams will receive notice of what apps are available for distribution in early 2019. 3. A user needs to use the app on at least three separate days between April 1, 2019 and August 31, 2019. Thanks Monica for the important clarification. So Tier One, not Tier Three as I had thought, requires that at least 5,000 people have attained the minimum threshold of participant downloads, and the winner will have the largest number of participants who have used the app on at least three separate days. Tier Three does not have a minimum threshold of participant downloads, and the award will go to the team in that tier with the largest number of participants who use the app on at least three separate days. Is that correct? If so, if a Tier Three team actually reaches or exceeds the Tier Two threshold does the team remain in Tier three, or automatically get moved up to Tier Two? If the team remains in Tier Three, and could actually have won in Tier Two that would be disappointing. If the team automatically gets bumped up to Tier Two and, as a result does not win, that would also be disappointing. Is there a good solution to that problem? You are correct in your understanding of the tiers. Upon registration, competitors must elect to compete in one of the three tiers. The deadline for switching to a lower tier is March 31, 2019. There is no deadline for switching to a higher tier. 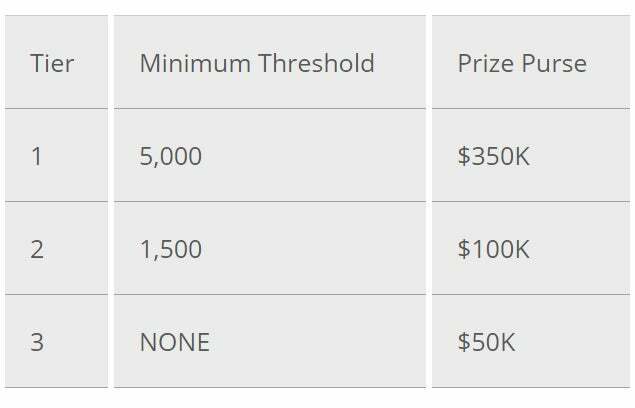 You can find more details on tiers in the competition guidelines in section 1.3. The next live Communities Competition Informational Webinar is Thursday, October 25, 2018 at 9:00 AM PDT/ Noon EDT. The $1 million Adult Literacy XPRIZE Communities Competition challenges communities, large and small, across the country to help low-literate adults, including immigrant English language learners, to download and use a free and effective prize-winning mobile learning tool. They will provide the educational apps – you just have to get them into the hands of learners. If this is of interest, Register here. Our next live Communities Competition Informational Webinar is on November 15th. RSVP via this link https://xprize.zoom.us/webinar/register/WN_z97gbdLtRVysQ2bfvvVx_w. You can also find previous webinars on our YouTube channel (HERE). You can learn more about the Adult Literacy XPRIZE Communities Competition at https://communities.xprize.org. Thanks Monica for alerting us to the Adult Literacy XPRIZE Communities Competition Informational Webinar on November 15th. If attendees want to discuss it afterwards, they are welcome to join us here. Those who are not LINCS members will need to join the Integrating Technology group here. Let me know if you would like me to send information on how to join the LINCS community and this group.